Windows are the area of your home probably most responsible for losing heat in the winter, and for unwanted heat entering your home during the summer months. However, your windows may be letting out more heat (or air conditioned coldness) than is normal. Rather than deal with this problem by filling up your window spaces with brick and mortar and hiring an interior decorator to give the dark interior of your new castle a medieval decor (we suggest oak-wood furniture and wall tapestries), consider some of these alternative measures for sealing gaps around your windows. Where are the Gaps and Leaks? Despite the fact that windows appear to be weatherproof (after all, they keep out rain, sleet, and snow, right?) they do let in small amounts of moisture or air, which is pretty unavoidable. But if your home is losing 30% of its heat and energy through leaks (as is the average home), it may be time to do a little research and figure out how you can reduce your energy bills. If you’re feeling drafts in the winter, especially by the windows, or if in the summer, you feel that the air conditioning is just not getting the house cool, you may have some cracks around the windows of your home. Make sure to confirm this theory by checking on other potential problem areas, such as the HVAC system itself, and your doors. If these areas are secure and in good shape, start checking the windows. Chances are you’ll quickly figure out that one (or a few) of your windows is (or are) the culprit that’s lowering the energy efficiency of your home. A good way to search for cracks is to use smoke. Since smoking cigarettes is bad for your health, don’t bother heading down to the convenience store for a pack of boxed and rolled tobacco. Instead, pick up some incense sticks, or dig through that box of tie-dyed shirts and psychedelic records to see if you have any incense sticks in there. That’s right: we said incense sticks. No, we’re not going to recommend a spiritual cleansing of your home. We’re going to recommend burning the incense sticks by every window, and seeing whether the smoke goes straight up (as it should) or if it’s drawn to the window area. Chances are that if the smoke is drawn to the window, you have a leak or leaks on your hands. Once you’ve figured out where the gaps and leaks are coming from, it’s time to get down and dirty and do something about it, unless you enjoy high energy bills and drafty winds at night disturbing your inner peace. Head down to the hardware store and check out some of these options for combating the presence of unwanted air in your home. Caulk is relatively inexpensive, can be found in any department or hardware store, and is the perfect sealant for anyone who can pull a plastic nozzle in a straight line—which is probably most of us. You don’t even have to be a baker with a special gift for using frosting to write words in cursive. Unfortunately, caulk is also messy, susceptible to mold, and only lasts for a few years, if that. 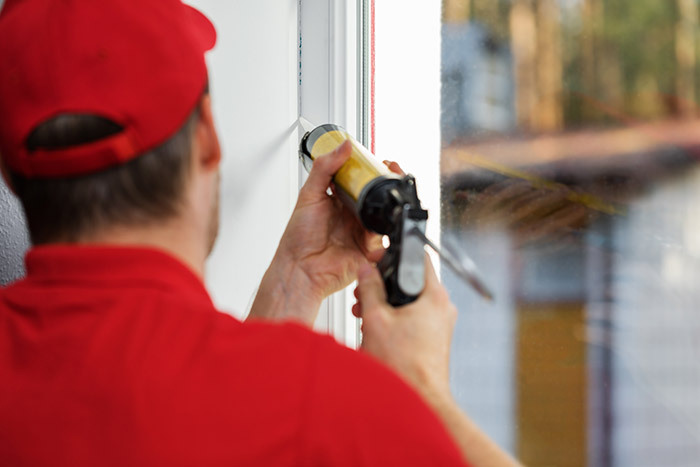 Caulk can be applied on the inside or outside of the window, or both, depending on the location of and how large the leak is. Weatherstrips are (as the name suggests) strips of material that you can lay on the inside of the frame, and they essentially provide a uniform second surface to cover any gaps, cracks, or leaks. You’ll need to purchase the bronze strips at the hardware store, and have a hammer and copper nails handy. This solution requires a little bit of technical finesse, so it may be best to hire a handyman if you feel that you can’t do precision work, but it’s a solution that will last for decades. This is the most expensive option, ranging from $15 to $35 for seventeen feet of bronze weatherstipping. This option isn’t as expensive as bronze weatherstripping, but it doesn’t last as long—although it does last around a decade, which isn’t that bad. It’s easier to install than the hammer-and-nails installation of its bronze cousin, and can be easily found at hardware stores. EPDM stands for ethylene propylene diene monomer rubber, but suffice it to say that it’s a synthetic compound frequently used a sealant for car doors and windows, so it’s an excellent, accessible, and affordable solution for treating the air leakage around your windows. At around $8 for ten feet, it’s not a bad deal. One understandable source of air leakage in the window frame is from the pulley system that facilitates the motion of a double hung window. A pulley seal is a small plastic flap that still allows the pulley to work, but covers the hole around the rope, preventing air from flowing in or out. The pulley seal is a nifty gadget at approximately $9 per pair. What if you live in an apartment and you don’t have the leeway to engage in such extensive home improvement tasks? What if, even worse, the management won’t upgrade your windows, or take care of the problem? After all, you (the tenant) pay the energy bill, so why should they care? Fear not, for there are a few solutions that can take care of this problem. This docile reptilian cloth creature is basically just something like a fabric tube filled with beans or rice. Lay it down by the bottom of the window to inhibit the flow of air from out of the bottom of the sash. This is a great solution that you can take with you when you move. Heavy fabrics, layered curtains, or curtains that specifically have thermal properties are great temporary solutions for reducing the air flow through the window. The downside of this particular solution is that you will have to drill holes in the wall to hang the curtain rod, which is itself an annoying task, but may also annoy your landlord as well. This material, sold in stores, is applied to your windows and then shrunk down with a hairdryer. Your window may look like a gift basket, but at least you’ll have mitigated the flow of air and energy through the window. Better yet, the solution is temporary, so you can take it down in the spring and fall when the weather is milder, and it won’t leave behind any drilled holes in your walls for curtain rods that can become a source of tension when trying to get your deposit back. There are also other types of weatherstipping material, such as foam, vinyl, or felt. 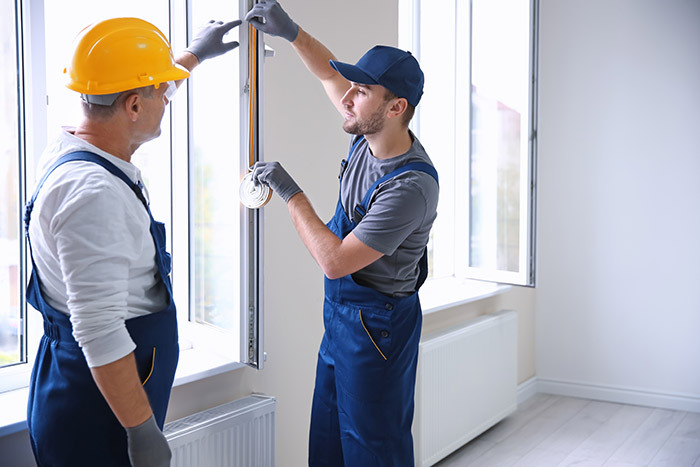 Take a look at what’s available in your local hardware store, and speak to salespeople and associates who can recommend a good product to use based on the size and location of your leak, the material of your window frame, and your contracting expertise (or lack thereof). You may even end up using a combination of several methods (for example, applying pulleys and weatherstipping). Whatever you use, you’re sure to enjoy the feeling of having more control over regulating the temperature of your home, and avoiding energy loss through window leaks.